The Upper Cretaceous Hemiaster (Hemiaster) bufo, in (a) aboral, (b) oral, (c) lateral and (d) posterior view. From Fischer (1966). For today's post subject, I've drawn the echinoid genus Hemiaster. Hemiaster is a member of the group of echinoids known as heart urchins, in reference to their overall shape when viewed from above. Species of Hemiaster are also fairly deep, so their overall shape when viewed from the side is somewhat reminiscent of a hoof. 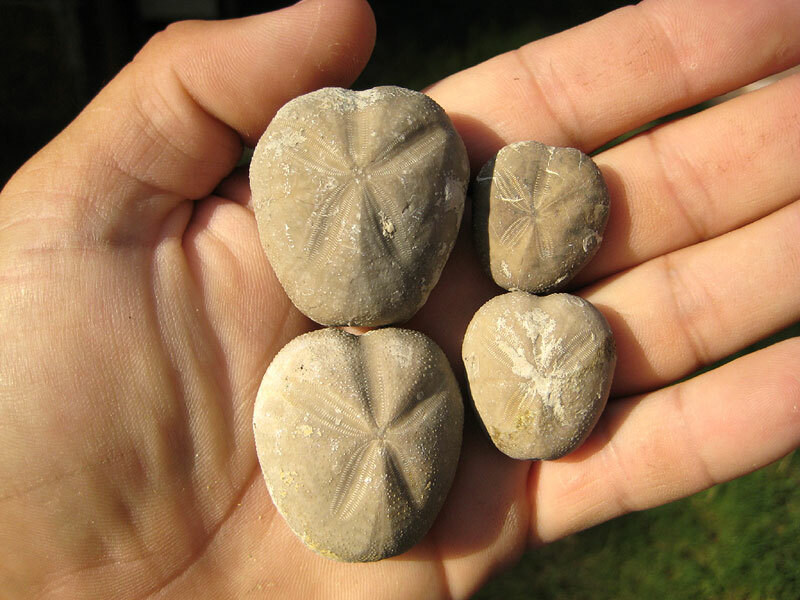 Heart urchins mostly live burrowed into sediment (mud, in the case of Hemiaster). 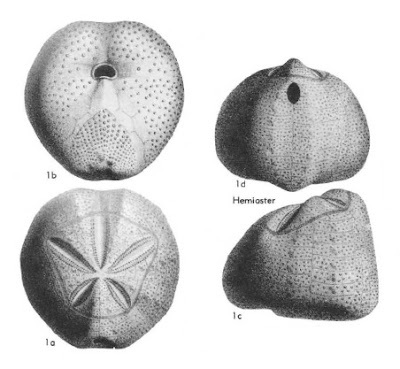 One notable feature compared to other echinoids is that they have lost the Aristotle's lantern, the 'jaw' structure found in regular echinoids. Heart urchins are detritivores feeding on organic matter either buried in sediment or deposited on the surface of their substrate. The specific habits of living Hemiaster species seem to be poorly known, due to their living in deep-water habitats, but an Atlantic specimen of H. expergitus has been found living in a 12 cm deep burrow with a narrow funnel opening to the surface (Gage 1987). In order to maintain their burrows, heart urchins have exceedingly long and well-developed tube feet, the openings for which in the test are visible as a petal-shaped pattern (and I must expose my ignorance, here: before I started looking up stuff for this post, I had always assumed that the petaloid pattern on heart urchins was on the underside. It is, in fact, on the aboral side). Also characteristic of heart urchins are fascioles, bands of closely-crowded tiny spines covered with cilia, that are believed to function in respiration by increasing water flow over themselves (a necessary process when the respiratorily available surface of the animal has been mostly buried by mud) (Fischer 1966). In Hemiaster, the only fasciole present runs around the space occupied by the petaloids; other heart urchins may have different patterns of fascioles on different parts of the body. Cretaceous Hemiaster whitei, from here. Fossils attributed to Hemiaster date back as far as the Cretaceous, and it appears to be better known as a fossil than a living animal. This is not entirely unusual for echinoderms: I have a vague recollection of Chris Mah, who works on living echinoderms, complaining about this very point, but I can't recall exactly where/when he did so (sorry, Chris!). Still, in some justification, Hemiaster was more diverse in the past than it is now: of the seven subgenera recognised in Hemiaster by Fischer (1966), only the nominotypical subgenus survives to the present, and none of the others postdates the Palaeocene. Fischer, A. G. 1966. Spatangoids. In: Moore, R. C. (ed.) Treatise on invertebrate Paleontology pt U. Echinodermata 3 vol. 2, pp. U543-U628. The Geological Society of America, Inc., and The University of Kansas Press. Gage, J. D. 1987. Growth of the deep-sea irregular sea urchins Echinosigra phiale and Hemiaster expergitus in the Rockall Trough (N.E. Atlantic Ocean). Marine Biology 96: 19-30. Is there anything particularly batrachian about H. bufo? You know, I'd wondered the same myself. Maybe Brongniart thought it looked a bit like a squatting toad? I think this probably has something to do with bufonites (toadstones), stones that were supposed to come from the heads of toads and cure all kinds of diseases. The name was apparently given to different kinds of stones and fossils, including fish teeth. Haven't found anything about the name being specifically applied to fossil sea urchins, though. Maybe. I had vaguely heard of toadstones before, but I must admit I had forgotten about them. Is this another example of an echinoderm group secondarily developing bilateral symmetry, or rather, superimposing bilateral symmetry upon radial symmetry? The irregular echinoids that this belongs to are all secondarily bilateral to some degree. Mind you, some are still like a regular echinoid in overall shape, it's when you look for the test openings that you see the irregularity.